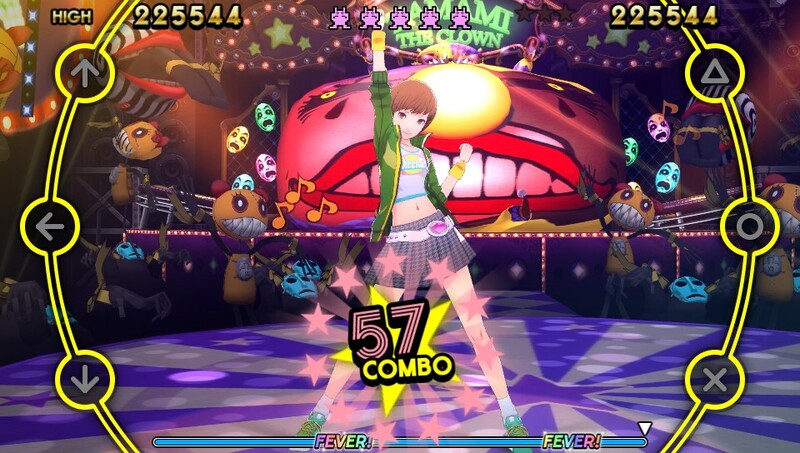 Persona 4 Dancing All Night, for the PlayStation Vita, is the most recent spinoff of 2008’s Persona 4. Set in the summer following P4’s ending, it picks up with the Investigation Team’s members preparing to dance as Rise’s backup for an upcoming festival performance. In typical fashion, something relating to the event comes up and threatens their plans, along with the lives of many who become involved via mysterious circumstances. If alarms aren’t already going off, let me put the nail in the coffin – instead of actually fighting enemies, the characters need to dance in front of them in order to “express their feelings” and turn them to the light side. Meanwhile, it manages to retread the same type of repetition that dragged down the first half of Persona 4’s story. Remember hearing “You’re not me!” about seven times? Strap in for the same general thing happening about five more times. Did you think I was joking? Even Naoto is cringing. I would also hazard a guess that this story was written by the same person/people that wrote Persona 4 Arena and Ultimax. Because they are hell-bent on jamming the importance of bonds and friendship down your throat or any other available orifices. 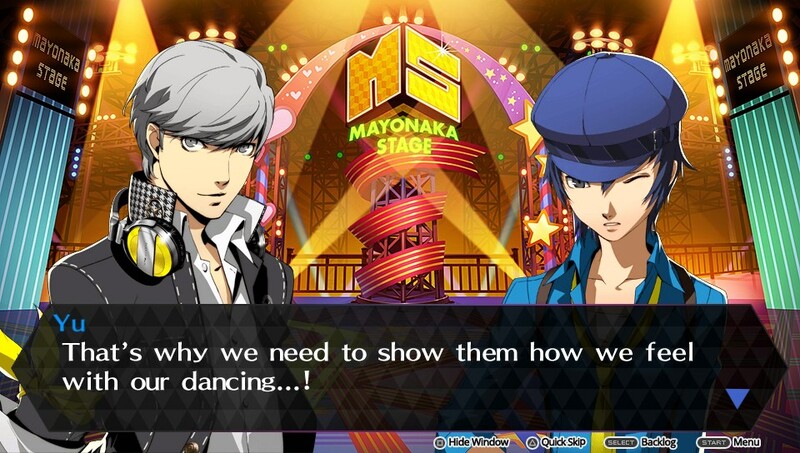 This was annoying in P4, aggravating in Ultimax, and somehow manages to be worse in Dancing All Night. Imagine a roller coaster with a dead horse strapped to the front of the car. Each time it passes certain points on the track, the horse up front smacks into dead horses hanging in the path of the car. And it goes through the full circuit like this at least five times. And now imagine a young kid urinating on the camera that this whole scene is being viewed through. That is Dancing All Night’s story in a nutshell. When beating a dead horse with a dead horse just isn’t enough. And just to remind you that you’re playing a rhythm game, the story is expanded enough to jam most of the songs in, even when they’re clearly forcing it. The contrived purpose for the dancing is milked till it’s dry in an attempt to make the story function. After completing every song in Free Dance (which requires that you complete the main story), you’ll unlock the Special addition to the story. Unfortunately, it’s a prologue that serves no purpose after you’ve already completed the story. It sets up the plot, explaining the situation and why everyone is involved, then spends far too long reminding the player of the characters’ defining traits. Just in case you forgot. The one good thing about the story is the final boss fight. Sort of. The boss is “fought” to the tune of another Reaching Out The Truth remix (wow, never heard one of those before), but all the Investigation Team members participating successfully ramps up the impact. It’s far better than “Let Yu do everything solo while we provide moral support.” Unfortunately, just like Ultimax, the final boss itself is a complete asspull. So as a whole, the story is one of the most difficult I’ve sat through in recent memory. Oh yeah, and they specifically call out an event from Persona 4 as something that “can’t be explained.” Because it can’t, because it makes no sense. Even the writers realize that at least. Character-wise, the game doesn’t have much to offer. The Investigation Team members are all present, but their roles have already been played out. 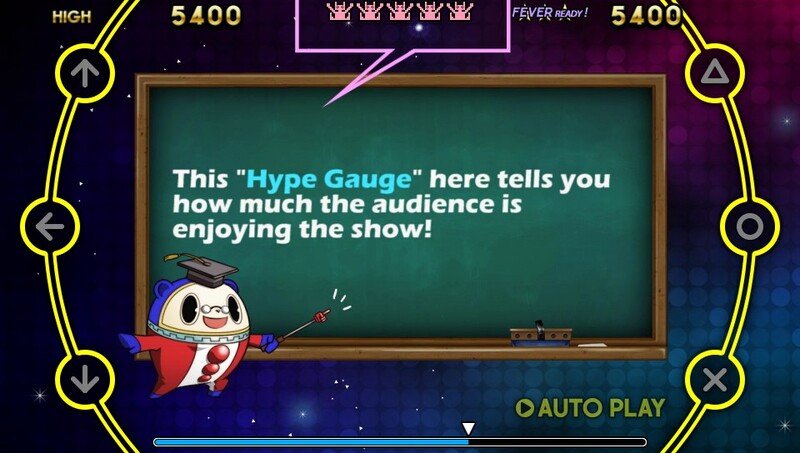 So it’s just more of them as we’ve already seen them in P4, Arena, Ultimax, and (to an extent) Persona Q. Any attempts at “character development” are for new and uninteresting side characters that hardly feel like they matter. And then there’s Kanami. From the player’s perspective, Kanami feels like a third wheel. Like someone who is out-of-place but politely being treated like they aren’t. She’s a bit like Labrys was during much of Arena, but worse – she’s kind of there, and the story’s kind of related to her, but the Persona 4 characters are the ones doing everything worthwhile. If it wasn’t for the main characters establishing shallow bonds like they were going out of style, she’d probably just be forgotten. And it would probably be better that way. Fortunately, if there’s one genuinely good thing about this game, it’s the music. To some extent. 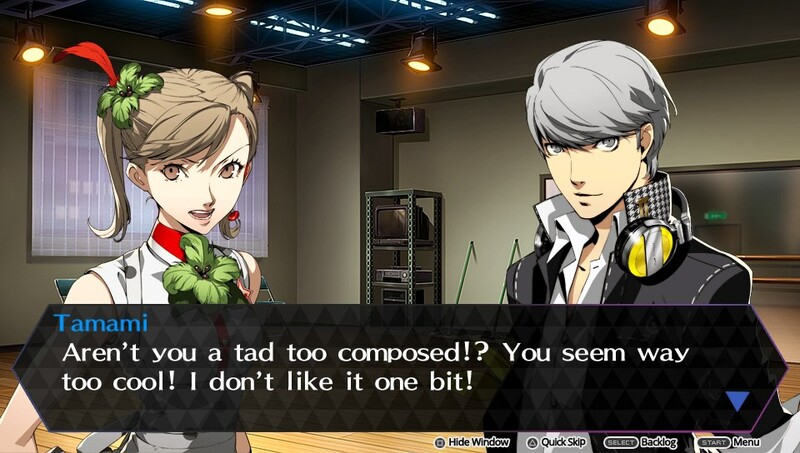 Most of the tracks come directly from Persona 4 and its spin-offs, but there are definite issues. Most notably, there are only 27 songs. This by itself isn’t necessarily a huge issue, but two things turn it into one. More than half of the songs are remixes, and there are only two brand new tracks. Because over half of the songs are remixes, there actually isn’t much variety in the music. For example, the original version of Pursuing My True Self is present, along with two remixes. Unfortunately, the remixes don’t give the impression of being new tracks, just inferior versions of the base song. So even when the original music is excellent, the quality of in-game options varies greatly. And as for the new songs, they are the opening theme, Dance!, and the ending theme, Calystegia. They’re both good – especially Dance! – but it’s a huge disappointment that more isn’t offered. One of the things I was most excited for with this game was the prospect of new music from Meguro and co. The rhythm game itself is okay, but not much more. Notes move from the center of the screen to the outer ring, and the player needs to press up, left, down, cross, circle, or triangle as the note meets the corresponding point. If two notes are connected by a purple line, they’re pressed at the same time, and if a note is green, you press and hold it through the note’s duration. There are also optional blue ring notes. These can be ignored and won’t negatively affect your performance, but they can also add to your combo if you aim for them. At certain points, they will have “Fever” written on them, and by hitting these three times, you will unlock a Dance Fever, which activates automatically during specific points in the songs (normally the chorus). This also boosts your score, makes it easier to keep your combo up, and your selected partner for the track can join if you’re performing well enough. The biggest issue, which too many rhythm games seem to do for no good reason, is have the player’s rhythm hardly line up with the actual music. This is made painfully obvious on songs such as Shadow World. On the Hard and All Night difficulty levels, the main bass line, played by the electric bass and/or piano, is a simple combination of eighth and quarter notes. Yet for some reason, the actual player rhythm doesn’t follow it. Instead of matching it note-for-note, which seems like the obvious thing to do, it adds in random notes, omits others, and completely throws off the rhythm. It’s moronic. 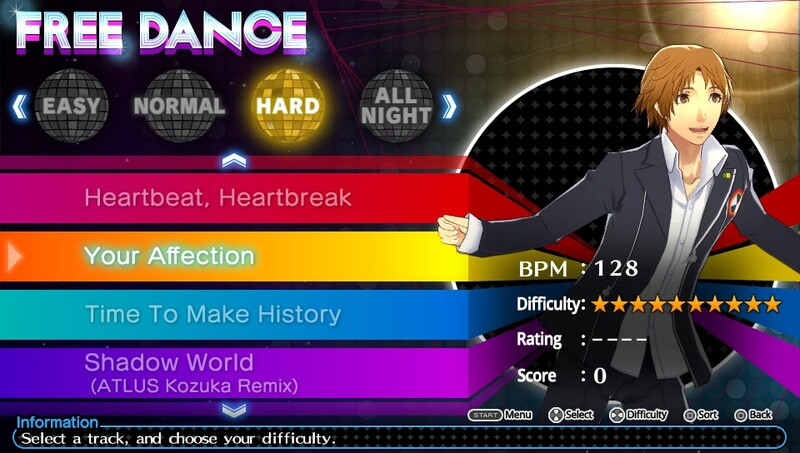 Besides that, my only big complaint with the rhythm game element is how easy it is to fail on the higher difficulties – even if you complete a song. While playing, your performance is rated by the Hype Gauge, which shows one of five colors, corresponding to five ranks – very bad, bad, neutral, good, and very good. In order to pass a song, you need to finish it at good or very good. However, this is a dynamic system. For whatever reason, instead of just failing outright because of a poor performance, it’s more likely that you’ll complete the song but not pass. What this means is that you can do very well on a song, screw up a bit right at the end and still finish the song, but not pass. In many cases, I’d have a bad start, then never be able to pull past neutral, even after combos of several hundred notes. In many of these situations, I’d even get a higher score than a different time I played it and passed. If you play a song as an Investigation Team member, their Persona will join them after passing a song and give a brief instrumental performance. For the most part, the instruments they play line up with what the characters played during Persona 4 Golden’s band bit, except Naoto. I’m not sure why. 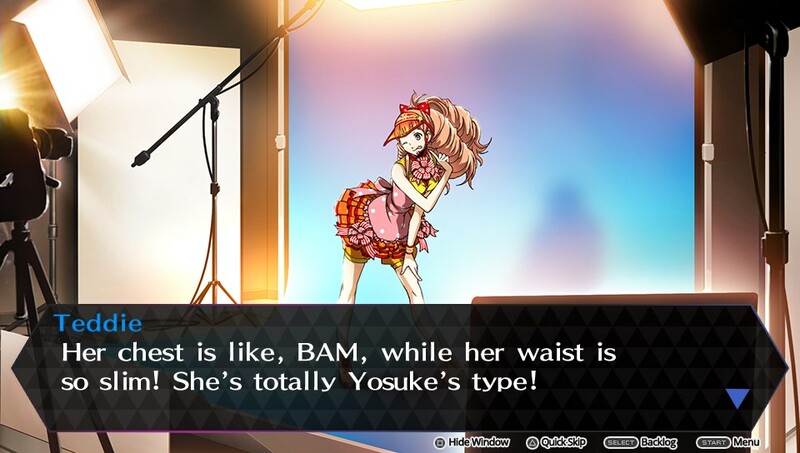 Teddie and Rise’s are different for obvious reasons – I can’t imagine a captivating tambourine solo, and Rise sang. On one hand, I want to say that this whole shebang is a pointless way to shoehorn the Personas into a game with no fighting, but on the other hand, Izanagi’s slap bass solo is one of the best parts of the game. So there’s that. Visually, the game looks nice. The character models and portraits look good, the choreography matches them well enough, and you can even dim the background if you find it distracting. Interestingly, everything is clearly designed for the Vita over PlayStation TV use – the outer ring is on the edges of the screen, so if you’re playing via a television it’s very easy to miss notes if your focus shifts away from the center. One of the best features is the plethora of outfit options, which many people will recognize from P4 Golden. 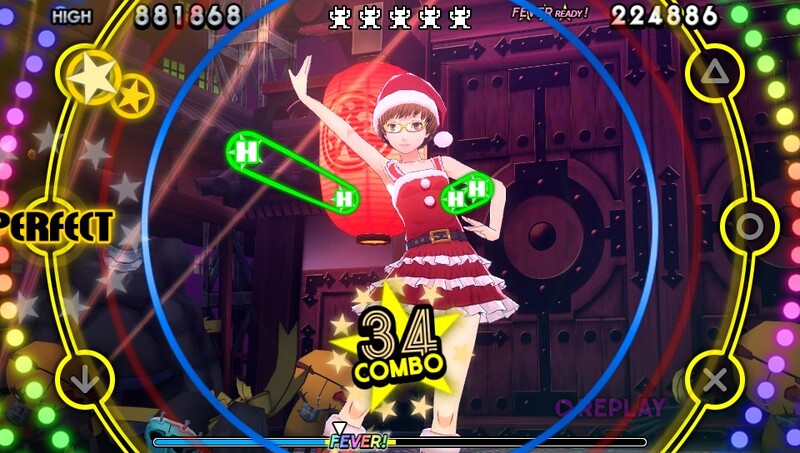 So you could be like me and put Chie in a Santa costume while everyone else wears Persona 3’s Gekkoukan uniform, or you could choose from many other unlockable options. As a whole, my opinions on this game are very mixed. The base songs are great, but the remixes are generally lackluster. Playing along to the music is normally fun, but it’s frequently hindered by the clash between the rhythm you hear and the rhythm you’re told to play. It offers a nice challenge, but seems oddly unbalanced to keep you from passing. And then there’s the story. That’s just bad. 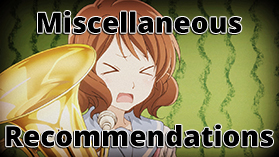 Recommendation – If you’re looking for a decent rhythm game, you might enjoy it – but listen to a few of the songs first, particularly the remixes. If you’re looking for any semblance of a worthwhile story, look elsewhere. Especially at this price. Chie cosplaying? Christmas has come early! I actually spent most of my time on the game before Christmas, but I’ll likely be sticking with that outfit nearly any time I revisit the game.